Turkey occupies a strategic position in today's world: the only predominantly Muslim nation to be a member of NATO and an ally of Israel, it straddles both Europe and Asia. Turkey is the link between Islam and Western democracy, between Europe and the Middle East. 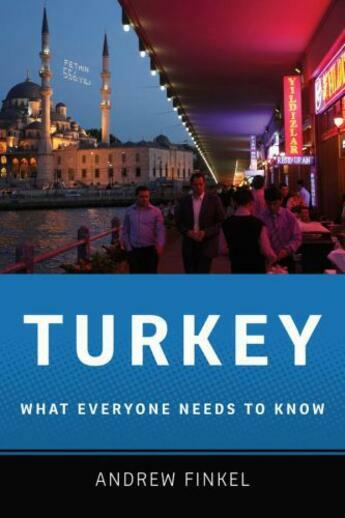 In this concise introduction, Andrew Finkel, who has spent twenty years in Turkey writing about the country for publications such as The Economist and Time magazine, unravels Turkey's complexities. He sets the complications and transformations of present-day Turkey against the historical background of the Ottoman Empire, the secular nationalist revolution led by Kemal Ataturk, and repeated political interventions by the military, which sees itself as the guardian of Ataturk's legacy. Finkel reveals a nation full of surprises. Where else but in Turkey, Finkel writes, would secularist liberals have supported a prime minister who was once jailed for promoting religious extremism? From the Kurdish question to economic policy, from Turkey's role in Iraq to its quest for EU membership, Finkel illuminates the past and present of this unique, and uniquely consequential, country.